The ideal Shiloh Shepherd has been developed as a calm, yet highly responsive working partner with a keen ability to follow even the most complex directions. These dogs are frequently noted for their overall attentive and biddable nature, not to mention their obvious pleasure in performing a job well done. There is little doubt as to the absolute connection which exists between a Shiloh and their owner - it is downright uncanny! As a result, many owners are discovering their Shiloh is a well suited prospect for the enjoyable and spirited teamwork in various areas of obedience competition. One such owner is Lorelle Jones and her Shiloh she calls "Baron". The ISSDC proudly commends this hard working team in our midst. Baron is the first Shiloh Shepherd in the history of the breed to earn not only the Companion Dog, and the Companion Dog Excellent, but also the highly coveted Utility Dog title! Lorelle has a previous background in obedience competition with her Rottweiler, but Baron was the dog that took her to the ultimate Utility achievement. At only one year of age, Baron took the obedience arena by storm and marched in to claim his 3 legs and the Companion Dog title in just 4 trials. Shortly thereafter, they made their debut in the Open division and were back in the ring competing. Still a very young dog of only 2 yrs, Baron earned his Companion Dog Excellent title in fine style. All the while working with local obedience groups, they continued to prepare for the most advanced levels and more competition in Utility. Onward and upward, Baron climbed to his UD as a mere 4 yr old. To date, he also holds 6 legs toward the UDX title. Lorelle describes the experience, "He always wanted to make me happy. Baron was incredibly consistent to show - it is an amazing feeling going in knowing your dog will pass. It is a true testament to Baron that he once earned 3 UDX legs in one weekend!" Update Feb 14th 2006 - It is with a heavy heart that Lorelle and Dave Jones let Baron join the other Shiloh's in the stars this day. Baron was recently diagnosed with Cauda Equina Syndrome, a nerve impingement in the lower back, which caused him to lose control of his rear legs, and be unable to empty his bowels and bladder. Our love and respect go out to Baron and his family, and may they continue to be an inspiration to all other Shiloh's and owners in perpetuity. More than ever before, Shiloh Shepherds are winning ribbons and trophies and earning prestigious obedience titles. Below is a list of increasing opportunities in this popular canine sport for rare breeds. Several professional organizations offer a combination of challenging exercises. There is an avenue of performance for everyone. THE ASSOCIATION OF PET DOG TRAINERS (APDT) was founded in 1993 by the renowned Ian Dunbar DVM, PhD. The APDT is the originator of "RallyO". All dogs are encouraged to participate in these events - rare breeds, purebreds or mixed breeds alike.This sport is a wonderful chance for talented teams to display their accomplishments in a relaxed atmosphere and offers alot of variation to the more formal obedience trials. To master a RallyO course, a team must perform the exercise at each individual station, all of which are described by a series of signs. The APDT places a strong emphasis on enthusiasm. Judges are looking for dogs and handlers both to provide a clear impression of the enjoyable RallyO experience. Handlers are allowed to encourage their teammate in the ring using verbal & physical praise. Food rewards are allowed in appropriate levels. SERVICE DOGS OF AMERICA is a United Kennel Club Affiliate. This new working dog organization sounds very exciting with lots of opportunities on the horizon for all breeds of dogs and the people who love them. The SDA offers at least 4 levels of obedience titles. First of which is the Family Obedience Title..The SDA designed this title with training exercises that develop a dog into a well-behaved family companion. This unique title offers both basic and practical obedience training that has useful applications in every day life with your dog. In addition, the Family Obedience Title is an excellent title for introducing new people to dog training and trials. The SDA has developed the OB1, OB2, and OB3 titles which may be earned via the obedience phase of their Protection-1 through the Protection 3. 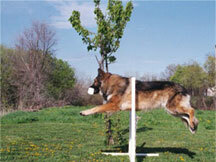 Special consideration regarding jump heights will be provided for Giant Breeds and Veteran canine competitors. AMERICAN MIXED BREED OBEDIENCE REGISTRY was established in 1983 in an effort to improve opportunities in the field of Obedience Trials. 1. Name and address of the parent club. 2. A copy of the breed standard. SCHUTZHUND OBEDIENCE opportunities include the B/BH ("Begleithund") Traffic Secure Companion Dog title as well as the more advanced divisions Obedience I, II and III for handlers who desire the challenge of training for and competing in Schutzhund style. 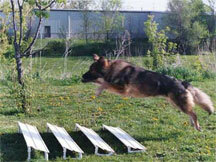 Roughly translated, Schutzhund means "versatility/efficiency test for working dogs". Obedience is one of the three phases. Those familiar with AKC obedience will feel comfortable in this area as many exercises are similar to those in Open and Utility. There is heeling, both on and off lead. The sit, down and stand are also done, except when the dog is moving.But Schutzhund applies it's own style to this work. Instead of a 40' ring, the handler and dog work on a soccer sized trial field. Some advanced exercises require the distraction of the noise of a firing gun. 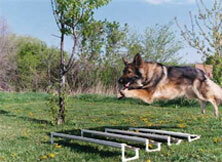 In addition to the normal dumbell retrieval, the dog must retrieve substantially heavy dumbbell over a 1 meter jump and a 6' wall. UNITED KENNEL CLUB is one of the largest purebred registries in the world. Local training clubs across the country frequently host UKC Obedience Trials, therefore opportunties for competition are readily available in many regions. These shows are well run and very respected in the working canine community. Qualifying scores may also count toward AMBOR titles for those dogs that are previously registered with their organization. UKC offers a special registration known as Limited Priviledge for dogs unrecognized by UKC. Their requirements do include that these dogs must be spayed or neutered to compete in their Obedience Trials & Rally events. If you would like to pursue UKC Obedience, you can find a registration form at http://www.ukcdogs.com/rg/forms.shtml The application must be accompanied by 4 photographs and the signature of your veterinarian. Check out the UKC schedule of upcoming obedience activities at http://www.ukcdogs.com/dogevents/upcoming/index.shtm. For all other questions, please visit http://www.ukcdogs.com. NATIONAL KENNEL CLUB is an all breed registry established in 1970. There are numerous NKC sanctioned clubs throughout the country including Germany and England. This organization is well known for their non discrimatory, fair and impartial treatment to all Shiloh Shepherds. In the NKC, Rare Breeds are recognized with equal status. CANADIAN ASSOCIATION OF RALLY OBEDIENCE: Their purpose is to encourage ALL dogs, pets, companions or titled Champions to participate in the fun and exciting sport of Rally Obedience. * To provide a venue for dogs to earn Rally Obedience in Canada. * To qualify and certify more judges in Canada so that more trials can be offered. * To maintain a registry of dogs eligible for competition. * To maintain a registry of trial results and titles awarded. * To establish a data base of training classes, clinics, etc. * To use the guidelines of APDT, AKC & CARO to promote RallyO to its fullest potential. ST. HUBERT'S COMPANION SPORTS DOG PROGRAM: This new Obedience Trial program was made official in January '06 and is sponsored by St Hubert's Animal Welfare Center. This facility is located in Madison, NJ and was founded in 1939. Their award winning shelters provide a safe haven and compassionate care for thousands of lost, abandoned, abused and unwanted dogs and cats every year.Any club, organization or school may apply to host a sanctioned trial or match. This event may be offered along with other canine activities. St Hubert's Companion Dog Sports Program is based on the traditional, precision type of competition levels and point values - Novice, Open, and Utility. However, handlers are allowed to encourage their dogs verbally during their performance! Food rewards may be given at the completion of any exercise. Both hand and voice commands may be used together, except in the Utility Signals routine which is limited to hand signals. Teams who demonstrate a good working relationship and a happy, upbeat attitude may earn Bonus Points during scoring by the judge. St. Hubert's CDSP is providing opportunities for all dogs. There is a one time registration fee of $25.00, and a $5.00 discount for altered dogs. To register your Shiloh to participate http://www.sthuberts.org/CDSP/applications.asp Many dog clubs are taking part in this worthy program. CDSP also invites junior handlers and/or handlers/dogs with disabilities. Exercise modifications will be allowed for disabled dogs and/or handlers. However, disabled dogs will not be allowed to compete if they are in pain or appear to be under stress.